This portrait painting continues my push to use high contrasts of light and dark to present a quickly readable abstract pattern, which in turn contains realistic details and modeling in the shaded and highlighted areas. Google Plus has many artists and art themes that are open to all G+ artists. 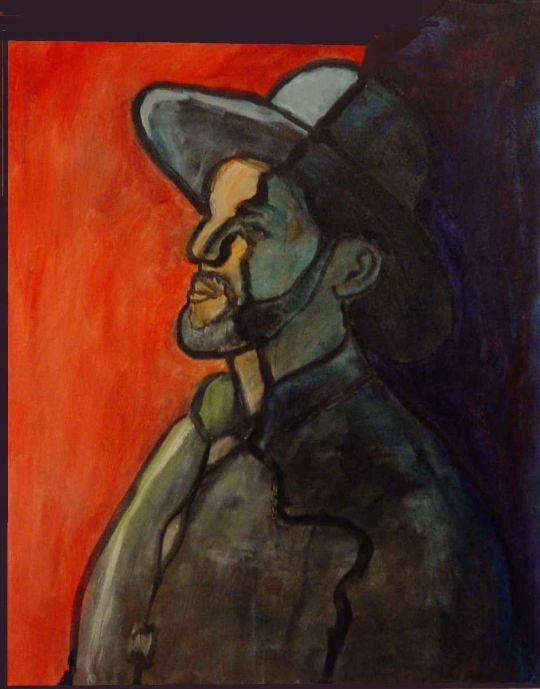 I’m pleased that my abstract, figurative painting, Preacher Man, is featured on Google Plus Arty Pics Of The Week. It is also on display at CornerStone Art Center & Gallery this May. The exhibit,The Struggle For Art IV, is at the CornerStone Art Center, in the Centier Bank Building, 1500 119th Street, Whiting, Indiana. 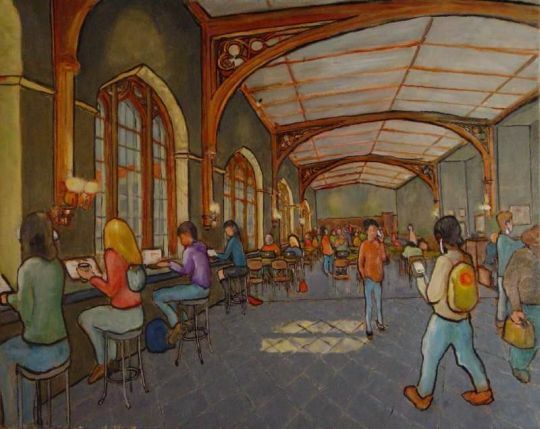 This exhibit is being held with 119th Street Artists, with curator, Jim Panos. The gallery is located 30 minutes outside of Chicago in NW Indiana in the Historic Downtown District of Whiting, Indiana. Art exhibit organized by 119th Street Artists. A picture is worth a thousand words and Chicago has a lot to say. 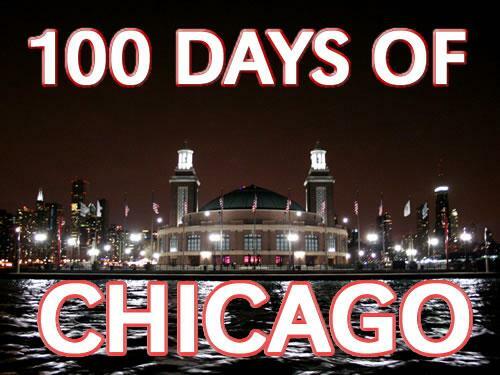 Welcome to the 100 Days of Chicago photo contest, brought to you by The Local Tourist. For 100 days, from February 24 through June 2 The Local Tourist will have a new photo of Chicago each day on the home page, and YOU decide which one it is! Simply give your favorites a + through June 2 and they could be on the cover of TLT. Beginning June 3 the 100 finalists will compete to win prizes! The top 10 finalists will be featured in an exhibit at the Chicago Photography Center! *Image: “Stop” Linocut by César Barberena. 2011. *For the first time the three brothers are exhibiting their Prints together in the US. Thursday, August 18th, from 6:00PM to 9:00PM.Exhibition runs from August 18th through September 11th, 2011. Three Nicaraguan Printmakers.- Robert Barberena De La Rocha. Robert is a visual artist based in his hometown Granada, Nicaragua. He Attended the school of fine Arts in Granada and the National school of Arts, Managua, Nicaragua.He has had solo exhibitions in Costa Rica, Germany and Nicaragua. His work has been exhibiting in group exhibitions in Galleries, Art Biennials, Museums and Art Festivals in various places including Bulgaria, Canada, Costa Rica, Egypt, France, Germany, Guatemala, Honduras, Japan, Nicaragua, Mexico, USA and Venezuela. He has received various awards, most notably the 1st place in the National Printmaking Contest at La Casa de los Tres Mundos in Granada, Nicaragua in 1997 and the 1st place in the National Festival of the Arts in San José, Costa Rica in 1992. He is a visual artist from Granada, Nicaragua based in Maryland. He Attended the school of fine Arts, Granada, Nicaragua, the National school of Arts, Managua, Nicaragua. He has exhibited in the Washington metropolitan area since 1990. 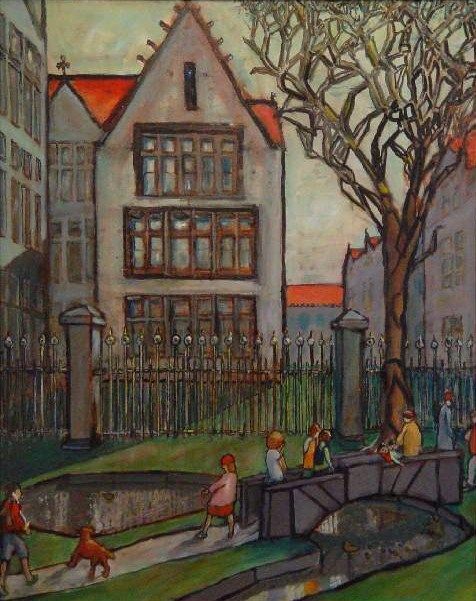 His paintings are include in many private and public collections. He is a Nicaraguan self-taught visual artist based in Oak Park, IL. He has had solo shows in Costa Rica, Mexico, Nicaragua, Spain and the USA. His work has been shown in group exhibitions in various Art Fairs, Art Biennials, Museums, Galleries, Cultural Centers and Universities in many places including Argentina, Belgium, Brazil, Bulgaria, Canada, Costa Rica, Dominican Republic, France, Germany, Italy, Japan, Mexico, Nicaragua, Panama, Paraguay, Spain, The USA, and Venezuela. 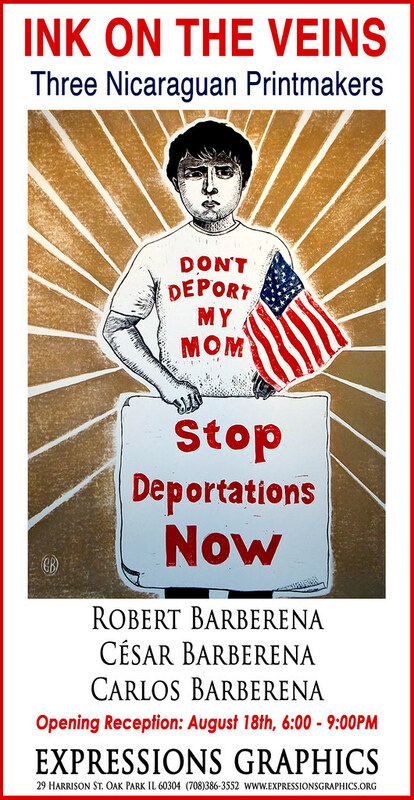 His work was selected to represent Nicaragua in the XIII Art Salon: Identity Imprint: A Glance at Ibero-American Printmaking at the Mexican Cultural Institute in Washington, DC. The V Biennial of Caribbean with the Umbrellas Project, Dominican Republic. The III World Body Art Conference in Venezuela, The 7th, 8th, 9th Lessedra World Art Pint Annual, Sofia, Bulgaria and the 8th Triennial – Mondial de L’Estampe et de la Gravure Originale, Chamalieres, France. He also has created many installations in public spaces in Costa Rica, Nicaragua and Venezuela. *Their works are include in many private and public collections. Expressions Graphics is a not for profit printmaking group partially funded by the OPAAC, in partnership with the Villages of Oak Park, Forest Park and River Forest, and the IAC, a state agency, also its members and Northern Trust Bank.